Every week we pull together some great Canadian recipes from Canadian food bloggers around the web featuring one main ingredient or dish. This week, we want to share with you 14 delicious Roast Dinners idea to bring your whole family together around the table. Roasting is not difficult but it takes a little bit of time. Patience is your best ally when it comes to cooking meats and veggies that you want crispy outside and juicy inside. Which is why roast dinners are usually reserved for weekends. But, they're a perfect way to get the whole family around the table at once! However, they can be soooooo easy! Once you get all your ingredients in the oven, Instant Pot, or slow cooker, you're done! Simple! Just a matter of waiting for a bit until a marvelous dinner is ready. You can even prep in advance and then throw everything on a baking sheet and, voilà! You're done. Chicken is the easiest and most common roast with the cooking method can be applied to most meats. Feeling like making a pork tenderloin? We have a recipe for you! How about some roast beef? Got it too! And veggies? There are a few ideas here as well. So go ahead, check out the gallery of Roast Dinner ideas below and get roastin'! 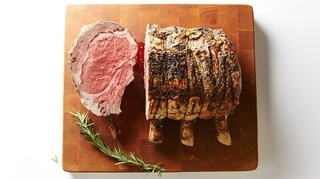 Ideal for a celebratory meal (or just because it's Sunday), this beautiful [Prime Rib Roast with Creamy Horseradish Mustard Sauce](https://www.bitememore.com/feedme/407/prime-rib-roast-with-creamy-horseradish-mustard-sauce), is rubbed with garlic, rosemary and thyme, is roasted until perfectly pink inside and browned outside. From **Bite Me More**. This crazy delicious [Orange Cranberry Roast Chicken](https://www.theendlessmeal.com/orange-cranberry-roast-chicken/) is covered with rosemary balsamic butter to keep it tender and juicy. It's a super-easy-to-make and healthy recipe that is as perfect for a weekend dinner as it is for a special holiday meal. From **The Endless Meal**. This recipe, [Paleo Pecan Crusted Rack of Lamb](https://theprimaldesire.com/pecan-crusted-rack-of-lamb/), is even better than it looks. On top of that, it is super easy! All you need is onions, garlic, yellow mustard, ghee, and salt and pepper. Voilà From **The Primal Desire**. A cross between a roasted chicken and Peking duck, this [Oven Roasted Five-Spice Peking Chicken](https://pupswithchopsticks.com/oven-roasted-five-spice-peking-chicken/) is for days when you have that craving the Chinese dish but chicken is all you have to work with. From **Pups with Chopsticks**. This recipe for [Whole Roasted Cauliflower](https://yummybeet.com/whole-roasted-cauliflower-hazelnut-orange-saffron/) combines fragrant orange, spices, and hazelnuts for a sophisticated but simple meal. It’s an exciting vegetarian or vegan main course or side dish and is super easy to pull off. From **Yummy Beet**. Easy and with almost zero prep, this 4-Ingredient Roast Chicken Dinner is sure to become a new family favourite. A fail-proof juicy whole roast chicken recipe that lets the oven do all the work! From **My Kitchen Love**. This easy roast [Spatchcocked Chicken](http://foodnouveau.com/recipes/mains/meat/spatchcocked-chicken-with-lemons-and-oranges/) recipe creates super tender, juicy, and flavorful meat you’ll enjoy with a delightful pan juice created by the lemons and oranges during cooking. From **Food Nouveau**. Click on the images below to be taken to more great Roast Dinner recipes! Mmmm they all sound delicious!!! Nothing like a good roast during our cold winter months, and that roast cauliflower is so unique!